Lorine Zineb Nora Talhaoui, or Loreen as you may now know her, is one person that can certainly not be accused of wasting years. At her present age of 31, she has had a life full of ups and downs, different homes, cultural experiences and unequivocal success. Despite all of this it has not been an easy road and said success has been well and truly earned. Coming from a working class family and a relatively small home Loreen mostly had to find her own way in music. Rather than tearing the house down with her passion for singing she began skipping school and heading for the most acoustically inspiring place imaginable, the church. Hours and hours were spent belting in the church and although at the time she thought she was alone, the priest was very aware of her escapades and decided to turn a blind eye at the skiving. Perhaps it was the potential he saw. Growing up Loreen had her mother’s record collection to learn from which entailed a wide of variety of styles from Barry White to Lisa Gerrard and an abundance of Berber music hailing from her mother’s Moroccan origins. Pop music came at a later stage and was no easy transition having been brought up on the unconfined trance like music of her heritage. To have regulations in song lengthand structure was not natural to her who still to this day will abide by certain morals when it comes to making and performing music. She feels this is a major factor in her success to date and will be strongly prevalent on her forthcoming album. 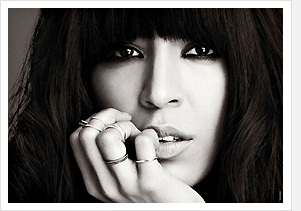 Loreen describes her voice as an instrument and refers to Jimi Hendrix in his manor of breaking down boundaries on the guitar as an influence on her vocal performances on the new album. She also states Grace Jones as a massive perspective and musical influence. Opportunities are rife in Sweden for musician’s thanks largely to a strong belief for self-expression along with an affluent number of courses and infrastructure. Live music is popular and venues and arts centres are plentiful meaning that Loreen and peers can exercise their passion more ably than in other countries in the world. Despite this she has often found herself on the move, claiming to sometimes spend just 3 months of the year in her home town of Stockholm. New York, Paris and London are said to be her favourite haunts with each place having its own artistic prowess, inspirationally and practically. Prior to competing in Swedish talent show Idol, Loreen seemed to take somewhat of a hiatus from music although she confirms that this was far from the case. She was instead mastering her craft, having burst on the scene and received endless amounts of advice and information, she calls it a priceless period and imperative in the way in which she has shaped herself into the artist she is today. Eurovision Song Contest 2012 was Loreen’s moment to set the world alight and she took it with a plomb. Having been presented a song, Euphoria, she listened to it and came to the conclusion that she would take it to Eurovision as long as she could put her own spin on it. After months of tweaking and nonstop work they had an end product that Loreen was content with and the rest is history. She emphasised the need for minimalism in her performance turning down extravagant lights and pairs of shoes in an appeal to appreciate her and the song for what it was. It worked and Euphoria became the second highest voted song in Eurovision history and then went 9 times platinum as a single in Sweden not to mention making its way to #3 in the UK charts, an almost unheard of outcome for non UK Eurovision entries.